This truly natural product does not contain peptide contaminants, chemical impurities, or anything else that is unnatural. Most ingredients are food based. Unlike other formulations of copper lotions, this product is water based, is free of impurities, uses food-based ingredients, is pH balanced to 6.0 (gentle on skin), and it uses the appropriate ratio of vitamin C to copper to yield the best results. Copper is reported to have anti-aging properties, at least cosmetically. Many of our happiest customers use it facially for this reason. Copper rejuvenates at a deep level, because it helps a body to produce new blood vessels whenever there is circulatory impairment. Zinc is used by the body to maintain healthy skin, hair, and nails, but zinc is more-or-less useless to a body without copper. Copper both tightens the skin and helps to improve its elasticity at the same time. This is a unique property of copper. Copper helps to heal damaged joints and it decreases the pain of joint injuries. This lotion is entirely water based, so it sinks in completely with no oily residue whatsoever. It just disappears. The ingredients of this lotion promote rapid healing of the skin, joints, and tendons. Some customers even call it a "steroid". The copper is entirely extracted using electrolysis (combining metal with water using electricity) for the sake of maximum quality and purity. No chemicals ever come into contact with the lotion, unless we count the citric acid that is used as a preservative. The copper concentration within our product is extreme, which makes it beneficial for external use. The absolute minimum is 600 P.P.M. of copper. The ingredients of this lotion are so safe that we developed it inside of our own kitchen, and we were not even wearing hazardous materials suits. Finally, there simply is nothing else like this in the world. A friend came to us with severely damaged skin on his hands, which had been brought about by his repeated exposure to harsh industrial detergents. The situation was so bad that his hands were regularly cracking open, and infectious boils sometimes resulted. We made it our mission to help him using safe and natural ingredients, but there were no such products on the market. We endeavored to help him in avoiding the standard steroid treadmill, which would have endangered his long-term health, and it would have only temporarily suppressed the symptoms. Working with a dermatologist would have furthermore caused a major financial hardship. Most importantly, we wanted to heal his hands, instead of just making them temporarily feel better with typical symptom treatments that would have eventually made his situation worse. It is what most lotions do. Practically all of our research into severe skin problems pointed us toward a single direction: copper. Studies prove that copper is useful in increasing skin elasticity (increasing elastin), producing ideal skin thickness, and for stimulating collagen production. Copper seems to have miraculous properties upon human skin. Copper is to the skin what vitamin C is to the overall immune system. It is essentially a supplement for the skin. This is why an extremely concentrated, pH-corrected, copper solution in both colloidal and hydroxide forms was chosen as the core of our lotion. Our formulation contains large particles of copper, in addition to having colloidal particles. Both small and tiny particle copper solutions have their own sets of benefits and degrees of penetration. Evidence shows that therapeutic solutions containing large metallic particles (like copper hydroxide) are the most effective for correcting skin and tissue issues, but smaller particles have deeper penetration. We use both to get both sets of benefits. The large particle phenomenon is similar to the situation wherein larger particle silver compounds are more effective for burn treatments. Unlike steroid solutions, our lotion is not dangerous. It dramatically heals skin and some joint injuries using copper, alongside food-based ingredients. 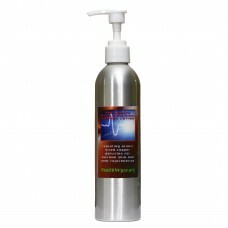 Our lotion causes much of the dead and severely damaged skin to flake off painlessly; especially when it is first used. It absorbs rapidly, and it leaves no oily residue. The lotion is water-based; using mostly food-based ingredients. It typically leaves the skin feeling baby-soft, and it is known for causing a brief warming and tingling sensation. In fact, it is designed to work like a liquid capacitor. Its electrical properties are not fully understood, but its unusual capacitance is demonstrated by the fact that its electrical resistance actually increases with the addition of more copper. Therefore, we are being quite literal when we suggest that the lotion will charge your skin. Natural products are often believed to be significantly less effective than their chemical and medical industry counterparts, but this lotion proves otherwise. * The term "hydroxide" merely means something dissolved inside water that already contains sodium. Industrial copper hydroxide is dangerous because it is not pH balanced, it is made with dangerous chemicals, and it usually has harmful impurities. Our manufacturing process uses only electricity to combine 99.99% pure copper, distilled water, and a small amount of baking soda. The baking soda is used instead of regular salt to avoid chlorine reactions and contamination. We use electricity to generate the copper solution instead of chemicals, for the sake of safety and purity. People with extreme skin problems should stay away from direct contact with latex. This includes latex in foods (avocado, bananas, chestnuts, kiwi, and perhaps even tomatoes). Many people have latex allergies because of vaccinations. Latex allergies can have terrible effects on the skin. Topical use of colloidal copper. Copper is important to the synthesis of both collagen and elastin. It has also been shown to increase the thickness of the skin. For a safe oral method of supplementing with copper, we suggest chlorophyll. Otherwise, do not ingest copper because it is dangerous unless it is naturally occurring in foods. The benefits of coconut oil seem limitless, and it is extremely useful for dry skin. Orally take a teaspoon or so daily. Buy only organic, cold-pressed coconut oil from a health food store. It is not expensive, and it will help. Vitamin C increases collagen and elastin. It is commonly used for the treatment of dry skin. Since unhealthy fats disrupt collagen production, there is part of the Budwig Protocol which should be helpful. Purchase flax seed oil capsules and mix the extracted oil with goat cheese. Yogurt can be used instead of goat cheese, but it is not as healthy, because it is usually made with homogenized milk. Make sure the flax seed oil is in dark capsules in a dark container. The oil can quickly become dangerously rancid when it is exposed to heat and light. Do not mix with a metal object. Wood is ideal. Get liquid iodine and place about a 2 inch (5 cm.) patch on your skin. Let it sink in throughout the day. Your body will absorb only the amount that it needs. Always avoid povidone iodine. Read the iodine article for safety information concerning the oral supplementation of iodine. You may have pre-diabetes. Check yourself and treat accordingly after reading our diabetes article. Try supplementing with niacin at a small dosage, but please read our article concerning niacin's strange side effects. Zinc supplementation is known to help with a variety of skin, hair, and nail problems. A body cannot properly utilize zinc without copper. You may have hypothyroidism if you have severe or chronic skin problems. Sunbathing is a helpful treatment for many skin diseases, such as athlete's foot fungus, psoriasis, acne, boils, and impetigo. Sunlight converts cholesterol in the skin into vitamin D-2 to help the liver. The lotion helps with joint pain and joint injuries. It promotes the rapid healing of extremely damaged skin and tendons. We are not allowed to make specific public comments about its true effectiveness in treating a variety of skin and joint diseases, such as psoriasis; due to F.D.A. censorship restrictions. It is illegal for us to make any "unapproved claims" that threaten the cozy pharmaceutical cartel manufacturing steroids and other medical treatments. For example, we could not tell you if our lotion helps with arthritis, if it in fact does actually help with arthritis, any more than we could make other unapproved claims involving skin diseases, such as psoriasis. You must discover these things for yourself, or learn about the facts from others. We really wish that there was freedom of speech in the health market, and that we could legally tell you the whole truth about our lotion. We invite you to do your own research about the many benefits of transdermal copper, and contact us if you need help finding credible scientific information (like studies from the National Institutes of Health). You are allowed to make whatever comments you wish to about our lotion, because you neither sell it nor manufacture it. So, please feel free to talk about it! Virtually all commercial hand lotions are full of toxic chemical additives or oils that smother the skin. Therefore, most lotions actually damage skin in the long term. Many of the chemicals in other lotion products are known to accumulate inside the body. They usually accumulate inside the liver, and they are difficult to eliminate. Most commercial lotions merely mask skin dryness by covering the skin in an oily layer of petroleum-based chemicals, which eventually makes skin health (and overall health) worse. Some lotions even contain plasticizing agents, which are toxic epoxy compounds. Even in the case of lotions which only use natural oils, such as Shea butter, the skin is still being smothered in oils, and nothing is actually being done to remedy the underlying problems. Most lotions sold in retail locations are designed by the chemical industry to be good for perpetual business, by being bad for our health, and they are made intentionally toxic enough for a long shelf life. The Health Wyze Colloidal Copper Lotion is for external use only, and it should be kept away from children who might put it into their mouths. Additionally, we discourage people from orally consuming copper supplements. Copper quickly becomes toxic whenever more of it is orally consumed than is needed, and it is reported to cause severe organ damage; especially to the kidneys and liver. Additionally, oral copper supplementation can cause Wilson's disease. With a healthy diet (especially an organic one), a person should already have plenty of dietary copper. The dangerously irresponsible industry of copper dietary supplements is one of many which we hope to someday drive from alternative medicine. The most common copper-based creams that are being sold are the ones containing copper peptides. Copper peptides are synthetic compounds that are alleged to mimic the biological copper compounds that are inside the human body. However, this belief and the overall science of biochemistry are both largely frauds, because science is still unable to precisely reproduce any nutrient that is found in nature. Exemplifying this, synthesized vitamins are never as effective as those found naturally in foods. Chemists have had their best success in creating synthetic vitamin C (ascorbic acid), but it performs differently in the human body to the natural vitamin C that can be extracted from foods, such as the original vitamin C supplement, which was extracted from paprika. Various chemists have inadvertently admitted this difference by making arrogant proclamations about how synthetic vitamin C has superior absorption over natural vitamin C. Of course, there could be no differing absorption rate if the two substances were actually identical, as they claim. They still cannot reproduce true vitamin C, awhile being unable to detect any differences chemically. It condemns the science as little more than a game of charades. Whenever the chemical industry boasts that it has created an identical copy of a God-given nutrient, then we can safely assume that it has differences, even when those differences cannot be detected in a laboratory. The following side effects of copper peptides demonstrate that they are damaging to the skin and liver. Some copper product sellers market that their synthetic copper peptides are identical to the natural copper compounds that a human body produces. The evidence of side-effects clearly shows otherwise; but even if it were true, then it would still not necessarily be a good thing. The real benefit of copper may actually be in the biological transformation processes, wherein a body binds copper with other substances. There may be no benefit in the finished copper compounds that they are trying to emulate. These may simply be another bodily waste product, and yet they are using it like a supplement, despite having absolutely no understanding of it. This sort of "science" reflects the typical stupidity and dishonesty that we have seen from the chemical community in its constant attempts to out-engineer God. The long-term results of copper peptide usage are examples of their failure. The greatest irony of the copper peptide products is that they yield exactly the opposite effect of what a good copper product should achieve. For example, the products are known to temporarily increase the elasticity of the skin, which is initially favorable; but a projected side-effect of copper peptide exposure is an eventual decrease in skin elasticity that is worse than the original problem. Sellers often claim that copper peptides reduce scars, but scarring is even more apparent on skin that is damaged and sagging. Since we know that true nutrients do not harm the human body (or skin) in any way, it is obvious that the ingredients of these products in no way resemble real nutrients, including organic copper compounds. In a manner that is typical of the chemical and cosmetic industries, the potential risks of copper peptides are being suppressed by the manufacturers. Companies which produce copper peptides are becoming notorious for only permitting glowing commentary about their products on their websites and forums. As a result, those who have had their skin permanently damaged by such products are congregating elsewhere for discussions. The victims of this sham often describe their skin damage as being like that from malpracticed laser surgeries. The primary reason why we use colloidal copper in our product is because there is no safer way to extract copper than through electrolysis. There are plenty of chemical methods for producing copper solutions that are cheaper, but they are unsafe, and they yield harmful chemical impurities. It is incredible that the copper peptide manufacturers are marketing their products specifically on the basis of including impurities, of which they have not studied for adverse effects; so many people are learning the truth the hard way. It is tragic that the majority of people who search for copper-based skin products are attempting to find natural solutions, but are tricked into paying the same chemical industry that caused their initial health problems, such as premature aging. We wonder when the lawsuits will begin against the copper peptide industry. Does the copper absorb deeply into the body to potentially pose a health threat? Copper can quickly become toxic with oral ingestion, because overdosing with it is so easy. Copper supplementation is unwise for this reason. It is like the situation with iron, wherein the metal is needed by the body, but too much is worse than too little. The copper overdose risk does not exist for transdermal (skin) absorption. Copper has an excellent safety history regarding people who have had skin exposure to it. The human body is well-equipped to manage the rate of skin absorption. In other words, the lotion is safe so long as it is used externally. Please keep it away from children, who might put it into their mouths. Can this be used safely as a general face cream even if there are no skin problems? Absolutely. This was never its intended purpose, but there is no reason why it should not be used in this way. Simply use it in small amounts, and as with most products, keep it away from the eyes. For optimal facial results, we recommend using our lotion on a rotating schedule with organic apple cider vinegar facials or oatmeal masks. Isn't copper hydroxide corrosive and dangerous? The copper hydroxide produced by Health Wyze Media is made only from water, a small amount of baking soda, and copper, which is later pH-balanced by the addition of other safe ingredients. Industrial copper hydroxide from the chemical industry is corrosive to the skin, because it has an alkaline pH. Our copper hydroxide is formulated to have a pH that closely approximates that of healthy human skin (e.g. slightly acidic). Furthermore, our copper hydroxide does not contain the dangerous impurities that chemically-produced copper hydroxide does. Technically, no chemistry is involved in our formula. We use electricity to combine copper with water, not chemicals. My child ate the copper lotion! What should I do? Don't panic. You should take action quickly and prudently, but time is on your side. If caught early, perform a stomach pump (induce vomiting), and give double doses of selenium supplements several times a day for several days. We also recommend giving the child a cilantro supplement once a day for a week (100mg. per 50 lbs. of body weight). This will help to chelate metals out of the body. Larger-than-normal doses of zinc supplementation taken daily for a couple of weeks will help the body to counteract copper. If not caught early, or if there are signs of liver toxicity (e.g. yellowing of skin or eyes), then follow the previous instructions, and seek medical help for implementing emergency chelation therapy. You may have to insist on chelation therapy, because chelation is the only thing that will negate an overdose of a metal that has reached the organs. Chelation is usually safe and effective. Do not take "no" for an answer, and visit another hospital if necessary. If your doctor seems ignorant, then ask him to reference EDTA therapy in his medical literature. Be sure you take this information (a print out of this) with you, in case you forget. Can I move it to a different container? You may, but it is not recommended. Trace chemicals that leach out of plastics can cause the formula to rapidly break down into a runny, watery solution. The same thing can happen whenever the lotion is exposed to oxygen, even if it is very briefly. The resultant watery solution will still be effective, but you are forewarned about the risk of it becoming runny. The lotion's gelling agent is not as stable as the chemical industry's counterparts, because our lotion utilizes natural ingredients. We had to make a choice between making the lotion right and giving it a long shelf life. I have developed a metallic taste in my mouth. Should I be concerned? Yes. This is always a bad sign. It most often means that your body has an overload of metals in it, but the problem is not necessarily copper. For example, your body may have an excess of iron, combined with aluminum and mercury. In such a scenario, a little extra copper in your body might be enough to overwhelm it in terms of overall metal overload. If you taste metal in your mouth, then you should immediately decrease your usage of our lotion, and use a little common sense as your first step. A good second step would be developing a plan for removing the excess metals from your body. A metallic taste may also indicate that you have a selenium deficiency, or that you have hypothyroidism. A selenium deficiency amplifies the effects of all metals. Tasting metal can also be an indication of arsenic poisoning, but this is very unlikely for most people. Reference our article about cleansing to learn more about removing heavy metals from the body. What is the storage and shelf life? It is impossible to make a natural lotion with the lengthy shelf life that toxic, petroleum-based lotions have. The thickening agents of our lotion have a shelf life of approximately 5 months, so we recommend only ordering an amount that you could expect to use within five months. At the five-month point, some of the copper will have disintegrated too, and the lotion may begin to develop mold. Our lotion comes with an expiration date for these reasons. For maximum shelf life, occasionally rotate or shake the bottle. Never unscrew the pump from the bottle for best results, since exposure to oxygen can cause the gelling agent to break-down prematurely. The life of the lotion can be expanded to well over a year if it is unused and kept refrigerated, so we strongly recommend cold storage for people who are ordering large amounts of the lotion. There seems to be no breakdown of the lotion when it is refrigerated. I spilled the lotion on something, and it became hard and impossible to remove after it dried. In the case of clothing, laundering is usually enough to remove it. On other surfaces, the pH must be changed to neutralize the gelling agents. We recommend removing it from furniture by covering the spill with a thin layer of baking soda, and then covering that with a damp rag or sponge. The lotion will easily wipe off between 5 and 10 minutes later. You can also use vinegar on a rag or sponge, but baking soda usually gives the fastest results. How much do I get per container? There is approximately 8 fluid ounces of copper lotion inside each bottle. Each bottle is 8" tall and 3" diameter. A bottle of lotion should last the average person about two months when used daily. Why do I experience some mild itching between 3 and 6 hours after usage? This can happen due to the following three reasons. The lotion's normal exfoliating effect leaves a tiny layer of loose skin cells. An excessive amount of lotion is used that leaves an invisible layer of chalk and guar gum on the skin's surface. You have highly sensitive skin, which could indicate a health issue. None of these are serious issues, and all of them are easily remedied in the overwhelming majority of cases. Having unusually sensitive skin may have been a factor in purchasing the lotion, and sensitivity issues usually decrease with continued use, which should indicate that the lotion is healing the damaged skin as intended. If there is mild itching, which is due to a residual layer of guar gum and chalk, then wash the hands with plain water whenever the itching is experienced. Both the guar gum and chalk will rinse away completely in plain water, and you may notice the hands feeling slippery at first. This is merely a product of the food-based proteins inside the guar gum. The other (active) ingredients will have long been absorbed into the skin and cannot be washed away. Remember that sometimes less lotion is actually more. Why did lotion leak from around the plunger when it was first used or opened? Sometimes pressure builds up inside the lotion during transit when it has been shaken a great deal, in a hot environment. It is usually not a serious problem, and the pump apparatus is typically undamaged. Simply clean the bottle by rinsing it with plain water, allow the bottle to cool, and then attempt to use it normally. It is possible to get a bad pump, but it is a very rare occurrence. The bottle's label is made of bumper sticker material, so you cannot harm it with water. Why did my lotion change color? Color changes are not usually a reason to worry. This is normal behavior throughout the life of the product. It is a unique product with some really weird science behind it. May I resell the lotion from home, my retail store, etcetera? Yes, but you must either ship it inside the original bottle with the original label, or place an easily readable notice on the new container stating, "Based on the formula from The Health Wyze Report". Proper attribution is required; regardless of whether the lotion is altered. Our lotion is licensed to individual customers, instead of sold. The purpose of licensing is to enforce the aforementioned attribution. Our licensing terms permit buyers to use and share the purchased lotions, at will, amongst friends and other associates. Therefore, purchased lotions may more-or-less be considered as the buyer's property. Restrictions are only in place for resellers. Do not use this product if you have Wilson's disease. People suffering from pancreatitis should not use this product, and should likewise avoid all other sources of copper, because copper will aggravate the condition.